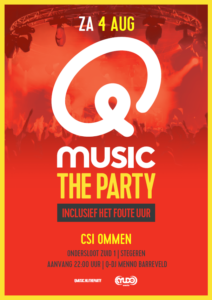 Saturday night the 4th of August, starting from 9 PM, the partynight of CSI Ommen. You should be there! Q-music the Party will make a rousing evening with also 1 hour wrong party that means with very old school music like 80’s and 90’s. Q-music is a very famous music channel in the Netherlands. There gonna be 2 dj’s of them at CSI Ommen at Saturday night. Also nice to know: entrance is free!